Anonijuana | Legion for legalization! 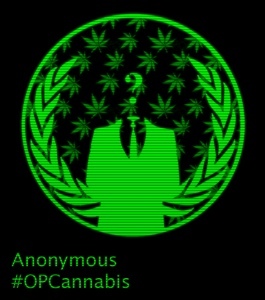 The Hackivist group Anonymous have a campaign for pot legalization “Operation Cannabis” (or OpCannabis as it appears on Twitter and in Anonymous dispatches). While pot smoke pours from pro-pot demonstrations in cities across the globe, Anonymous and it’s supporters will be behind computers, trying to raise awareness of the benefits of the herb. “We have heard and we have watched your governments lie and deceive on all of the dangers of cannabis. For far too long, cannabis has been oppressed by big corporations, Big Pharma and government when it could be benefiting all of mankind in many different levels”. Anonymous elaborates in an OpCannabis press release, citing the versatility of cannabis and most notably it’s medicinal properties. If life has no other purpose, it is to continue itself. While there remains much debate about when and how life began on this planet, we know that humanity in its modern form has only come into existence in the most recent of Earth’s history. Since that time we have spread our species across the entire globe, driven by our innate desire to improve our own quality of life, as well as the lives of those to come. Built into us is this need to propagate, to create offspring that will be an improvement upon their predecessors, because we do not wish our children to struggle as we had to. In light of this, we have reached a point in our apparent progression where it is necessary to re-examine our actions, specifically in terms of how they will affect future generations. Presently, we live in a world that mostly criminalizes the cultivation, use and distribution of Cannabis. Those who have faith in the righteousness of law do not recognize how this drug policy hurts them and therefore feel no need to question its continuation. Increasingly though, many are becoming aware of the danger to themselves and their loved ones that this societal situation imposes. Those of us with kids realize the awkward position this puts us in. We are forced to choose between advocating that they abide by the law or that they minimize harm to themselves. On one hand we have civilization, which denounces and punishes marijuana use, while promoting more destructive substances such as alcohol and tobacco. If left unaddressed, it is likely that our children will use these legal drugs if they seek out altered states of consciousness. On the other hand, we have our sense of protection as a parent, which compels us to inform our kids about the dangers of different drugs and suggest that they use the least detrimental one possible – pot. Regardless of how we approach the marijuana issue with our children, they still remain in harms way due to the legislation in place. If they choose to smoke weed (the healthier choice) they risk incarceration, a criminal record, loss of financial aid, etc. If they choose to use alcohol or tobacco (the legal choice) they risk detriments to their physical well-being. All the while, when faced with the same choice that our children must resolve, cannabis use is completely out of the question for us. Doing so would risk not only our current and future employment; we’d be taking a chance at having our kids taken away from us. In this way, our government has completely removed our ability to lead by example. All things considered, the role of a parent under marijuana prohibition is a needlessly stressful one. Inconsistencies between our actions, the law, and what is the right thing to do may result in confusion and mistrust in our children. As the ones who will carry our legacy into the future, we only wish to prepare them the best we possibly can. It is unfair to us and them that we can either be safe or lawful, but not both. For the sake of all future human generations, this problem must be confronted. The solution is legalization. Since the middle of the 20th Century we have been deprived of access to legal cannabis, leading to many noticeable negative consequences including the increasing cases of cancer, the increase in incarcerated citizens, and the increased cost of healthcare. One of the less publicized aspects of marijuana prohibition though, is the fact that it has in no way lowered the demand by society for what this plant provides: chemical comfort. While marijuana remains illegal, it also remains one of the least dangerous substances know to humankind. There is not a single recorded death from it in all of history, due to the fact that it is physically impossible to overdose on. However, man-made “alternatives”, although legal, cannot be said to be as safe at all. Synthetic marijuana is sometimes sold as “legal bud” and other times under the guise of household items such as incense and bath salts. Many of these products, which go by flashy names like K2 and Spice, are labelled Not For Human Consumption, but are sold solely for that purpose anyway. These are substances are designed to create an effect similar to smoking weed, and are put out on the legal market without regulation, nor certification of safety. These substances have led to many health problems, including heart attacks and the tragic “zombification” of users, as was seen in Miami this past Memorial Day. Unfortunately, because they are legal while natural marijuana is not, they are very accessible. They can even be ordered over the internet, and are advertised for in a very misleading manner. People who use synthetic marijuana are citizens that wish to be law-abiding, who do not deserve a detriment upon their health for doing so. The fact of the matter is that this situation shouldn’t exist at all, we should not have individuals faced with the decision of legal/harmful vs illegal/safe. It is an unfair and immoral choice to force on consumers, that completely undermines the purpose of the free market. During Alcohol Prohibition, there existed an atmosphere conducive to crime and a general disregard for the authority of law, which exists again today. Marijuana Prohibition is why the Drug Cartels are selling a safer product than the one available in the store. Cannabis needs to be legalized, simply as a matter of public health. Let’s take a moment to reflect upon where we have come to so far as a species, and afterwards another few moments to discuss the path we are currently on. Whether or not you believe in the evolutionary process, intelligent design, a combination of the two, or something completely different, no one can deny the interconnectedness of nature and humans. Being our planet’s most intellectually developed creatures, we have not only the capacity to protect or destroy it but also the ability to choose which we will do. With 7 Billion+ of us now inhabiting the Earth, we are the single-most largest consumer of it’s natural resources. Our increased population’s demands have led to much deforestation for the sake of creating agricultural space and harvesting trees, the raw material for many everyday products such as paper. Because of this, experts say that in the next 40 years, the rainforests could be completely gone. The problem of deforestation is dual-sided: aside from permanently altering sensitive ecosystems, we are changing the composition of our planet’s atmospheric gases. Plant life, especially trees, act as a natural converter of the greenhouse gas Carbon Dioxide back into Oxygen. In this way, humans and plants can live symbiotically, as we continuously recycle each others byproducts. But, by removing so much plant biomass from the global climate equation, we are left with an excess of CO2, resulting in the increase in average temperatures being witnessed all across the world. While some may say it is an unfortunate, inevitable side-effect of human progress, they are wrong. This rate of deforestation is firstly unnecessary and secondly, inefficient. We need not destroy these places for our own benefit, because nature provides us with a better way: the Cannabis/Hemp plant. This renewable resource can be harvested yearly, rather than the lifetime it takes a tree to grow. It can grow in ANY climate, and will outcompete surrounding weeds. It is naturally resistant to many pests, eliminating the need for pesticides. To produce the same amount of fiber as 4 acres of forest, only 1 acre of hemp is needed! For a safer more prosperous future, we must embrace nature, rather than prohibit and destroy it. Power must be returned to the People, and our Hemp plants to the Earth. We cannot change the past, but everyday we make the future. We cannot undo the damage which has already been done, but we should make an effort to leave this place better than we found it. Hemp will help heal our world, and must be freed from the bounds of law. Legalization is needed, it will slow Climate Change and strengthen local communities! There is a disease of which you are all aware, that has plagued humankind throughout the ages. It is a terrible affliction, called Cancer. As far back as we have been able to look into the past, we have found evidence of its existence. In recent history, this disease has become more prevalent and more notorious a killer. You may have heard someone say, “These days, everything causes Cancer”. In 2008, 7.6 Million deaths across the globe were directly due to the disease, and that number has been and is expected to continue to rise every year. This is a huge burden upon our healthcare systems that also weighs heavily on our hearts. The loss of any human life is a shame, but 1 out of every 8 deaths coming from a single cause is nothing less than a tragedy. For decades people have donated what they’ve been able to, to the effort of finding a cure. As the death toll increases though, it’s apparent that these undertakings have done little to stop this trend. Aside from Cancer accompanying us throughout our existence on Earth, there has been another companion of ours, which has acted as a counter agent: the Cannabis plant. Although, due to its modern legal prohibition, marijuana’s anti-cancer properties have been made hard to research. The results are nonetheless miraculous! Consider the case of young Cashie Hyde, whom without the plant’s oil would’ve died. What these facts bring into question is the legitimacy of our purported search for a cure, when there already exists one that naturally occurs. Rather than trying to cure a person after they’ve become diseased, we could take a preventative approach to Cancer. People could grow Cannabis plants in their own homes, and keep themselves from becoming Cancer patients! Can you imagine all of the pain, suffering and lives that could be saved? There are forces though that would keep us from achieving this reality. I am speaking of the profiteers of our illness, the perpetuators of our poor health and the designers of our deaths. Follow the money trail. They are Big Business. 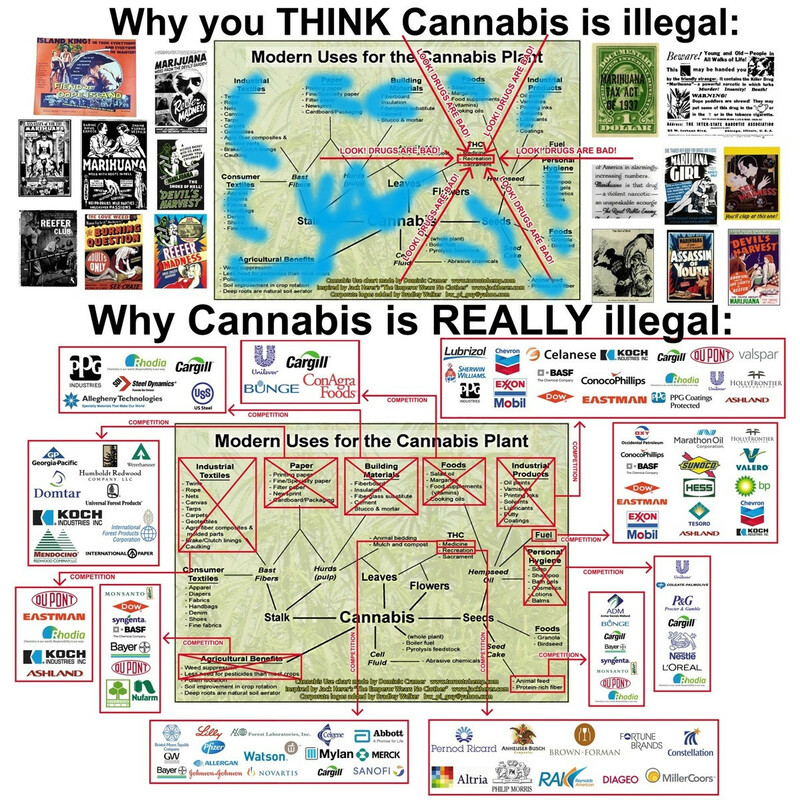 They are the Cancer Industry, an enemy of We The People, and one of the reasons Cannabis is still illegal. He spoke out against the failed War on Drugs in 2004, but his administration has done nothing to alter it’s status, aside from increasing it’s spending and attempting to change it’s name. Having acknowledged the medical benefits of marijuana in an interview with the Marijuana Policy Project in 2008, he has made no effort to federally reschedule marijuana so that doctors across the country may prescribe it. Even though he vowed in an interview with Oregon’s Mail Tribune in 2008 to respect state medical marijuana laws, he has instead done the opposite, best exemplified by the federal raid of Oaksterdam. 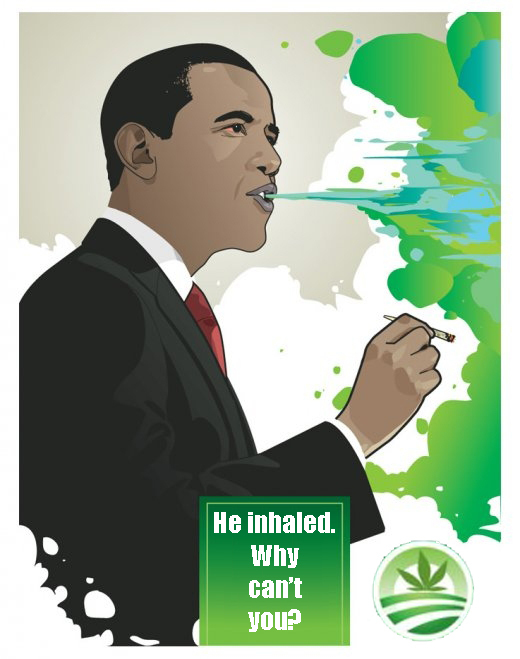 After he admitted to using it himself, he has done nothing to reduce the number of Americans in prison for marijuana related “crimes”. On his original presidential campaign trail, Barack Obama’s mottoes were Change and Hope. On the White House website, one would get this impression that these promises had come to fruition, as his administration claims to practice a “21st Century Drug Policy, reliant upon science, research and evidence”. When comparing Obama’s national drug strategy to that of his predecessor though, this statement falls apart, as little distinction can be made between the two. Apparently we cannot hope for any change from the current U.S. President, when it comes to addressing the many flawed marijuana laws. It has been considered common knowledge that when a war is conducted there will emerge one side as victor, and the other as loser. There is a particular war that defies that logic and whose battle lines are not so clearly drawn. To which am I referring is the United States of America’s War on Drugs, declared by President Richard Nixon in June of 1971. …With nature’s most prominent medicine locked away + anyone who uses it locked up, Pharmaceutical companies are able to synthesize chemicals that target single symptoms rather than the array of ailments that marijuana assists with. So, not only can you not grow the cure-all in your own home for free, you must pay for your relief on a case by case basis. Amidst all this is an emerging acceptance of alternative forms of drug use than the traditional alcohol, caffeine and nicotine. In 2011, the public approval of marijuana legalization reached 50% of all Americans, a reflection of the inability of our elected officials to properly gauge and/or react to the will of the people, as no federal efforts to reform marijuana laws have come to fruition. War on the American People and their Rights.